Will My Child Have To Testify In My Colorado Domestic Violence Case? - Denver Criminal Attorney Specializing in Domestic Violence Cases - Colorado Criminal Defense Lawyer. 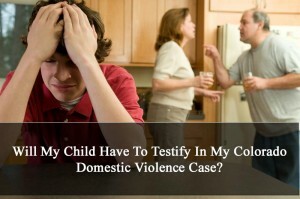 Will My Child Have To Testify In My Colorado Domestic Violence Case? – Unfortunately children are often present during altercations between their parents or a parent and a significant other. This article examines the decision to call that child (or children) at trial in the defense of the case or utilizing their testimony in other capacities. act as either witnesses and/or victims of adult domestic violence. The names of the children victims of domestic violence will be found on the witness lists disclosed in all domestic violence case filings. If they were interviewed – their statements are always included in the police investigators case reports. Because of the unique relationship that children have to domestic violence cases – they often prove to be the least biased and most truthful source for either side to call on at trial. But this is a dangerous area for the defense for many reasons. Colorado law enforcement will look to the children, if present, in domestic violence investigations for the unvarnished truth. The kind of truth that only a child can provide sometimes. If a child is present, the police may be specially trained or they may bring a forensic expert to take the child’s statements along to be included with the statements of all other witnesses taken by other investigators on the scene. Colorado domestic violence cases can take the form of the very rare long-term chronic violence case to the more typical “isolated incident” in the context of an argument. In “dual charging” cases both intimate partners are charged. The police, in these cases of mutual assault, often have no choice, where it is unclear, based on their investigation, which party was the “primary aggressor.” In these situations the prosecutors of these cases, usually Deputy District Attorneys, must look to other evidence to determine how to successfully prosecute the case, if that is possible…. and that includes calling children witnesses. On the other hand, making the decision to call or not call a child for the defense in a Colorado domestic violence trial, has even more complex issues to consider. Understanding the unique and complex needs of children in these cases and the potential damage that can be done versus the benefit achieved is critical to making the right decision. Because every case is different there is a need for an individual assessment to take place of the facts and circumstances with a close integration of the child in mind. The child’s family history and perspective on the prosecution of the case have clear implications on whether a full, fair and candid account in the courtroom can actually take place. If the defense has no choice but to call a child as a witness in a criminal case, it will always be the most painful of the decisions made by the criminal defense lawyer. It is very important that the lawyer does his or her due diligence as regards the obvious multiple traumas of divided loyalties, guilt, internal and external pressure not to testify and other are predictable impacts and experiences within the mind of the child. To say that the child witness feels a complex range of emotions that includes themselves, their parents and their family – emotions such as such as worry, fear, guilt, relief, sadness, anger, helplessness, powerlessness, blame, shame, embarrassment, anxiety and stigmatization – is an understatement. It is therefore recommended that an early screening be performed by a competent therapist to assess the ability of the child to sustain being called in this capacity. The child’s complicated feelings about the accused need to be fully understood very early in the process because of the strong possibility that the child may actually end up hurting the defense case. 3. worry that the accused parent may suffer in jail, prison, or lonely without his family. While children obviously hate testifying, the defense migraine decision to call a child as a witness also involves the impact of the testimony on the case. Whether to call, or not call a child witness will depend on such factors as the age of the child, gender, emotional closeness to either side of the case, and the characteristics of the alleged violence in the specific case such as the intensity, duration and history of that domestic violence. Was there a visible injury to the non-offending parent? Did the child actually tend to an alleged injured parent before help arrived? Was the child injured during the incident? Is there a history or pattern of violence in the family? Did the child actually call the police, a neighbor or extended family for help? Did the child “outcry” to someone outside the home such as a teacher, police officer or a social worker? Did the child gave a comprehensive or only a brief statement to the police during the investigative process? If your criminal defense lawyer decides that the need for the child’s testimony outweighs the risks of not calling that child, the child needs to understand exactly WHY they are being called and what testifying actually means. You should be careful to make a responsible choice in selecting a Colorado Criminal Defense Lawyer – and we encourage you to “vet” our firm. Over the last 30 plus years – by focusing ONLY on Colorado criminal law – H. Michael has had the necessary time to commit to the task of constantly updating himself on nearly every area of criminal law, to include Colorado criminal law and procedure and trial and courtroom practice. H. Michael works hard to get his clients the best possible results in and out of the courtroom. He has written, and continues to write, extensively on Colorado criminal law and he hopes this article helps you in some small way – Will My Child Have To Testify In My Colorado Domestic Violence Case? Unfortunately children are often present during altercations between their parents or a parent and a significant other. This article examines calling that child (or children) at trial in the defense of the case or utilizing their testimony in other capacities.